Sach Khand (“Realm of Truth”) is the Sikh concept of Liberation from the cycle of birth and rebirth. It is achieved by the Guru’s Grace and through meditation and Simran, remembering the Divine. There are two understandings of Sach Khand in accordance to Gurbani. The first is Sach Khand as a spiritual state of being liberated whilst alive through immersing oneself in the Divine Truth and becoming inseparable to the Truth (i.e. God’s Light). The second is Sach Khand as a spiritual realm or spiritual place where the blessed souls go after death. Once a devotee attains Self-realization, he becomes situated in this final realm of Truth (Sach Khand), the ultimate stage of Spiritual experience of linking with the Absolute. Sach Khand is a state of mind that you enter when you are alive. It is a state beyond duality or description, a state of Eternal Wonder and Light, which can neither be made to order or give to an another person as a gift. It can be known only in personal experience. It’s also called in the Gurbani “Chautha Pada” (Fourth State) because it is beyond three qualities of Maya. Some other names for it include “Sehaj Avasthaa” or “Turiaa Avasthaa” (Supreme State), “Param Anand” (Bliss), “Jeevanmukti” (living liberated), and so on. It is a state of existence in which the soul (Aatma) of the individual is linked and united with the Parmaatmaa (Supreme Soul), like a drop of water in the ocean. At this point, the pure devotee or seeker has become one with God within. Here, he identifies himself with the One True, Formless, Infinite Consciousness. Linked with his Origin, the Absolute Reality, his Soul links with the Spirit just as rivers merge with the ocean. This is the journey of an Spiritual aspirant. This journey begins from a material plane and ends at the Spiritual Plane. According to Sikhi the ultimate goal of a Sikh is Sach Khand which is far greater than any heaven(s), as believed by other religions. It is a state of union with God in which the soul forever enjoys spiritual bliss rather than physical pleasures like the heaven(s) of the Bible, Quran or Tohrah. Guru Nanak Dev Ji went to bathe in the River Vein one day and did not come back out for 3 days. Guru Ji came back out and described how he had gone to Sach Khand and received a special mission. The beginning of the concept of Sach Khand can be in the fact that Guru Nanak Sahib Ji has first talked of this place. Bhai Gurdas Ji says that Guru Nanak Sahib Ji was called to Sach Khand and given Naam from God himself and then the mission to spread this path of Naam (Gurmat). “Pauree: I was a minstrel, out of work, when the Lord took me into His service. Those who follow the Guru’s Teachings, who eat this food and are satisfied, find peace. So it is clear that Sach Khand is a place. It is clearly not a place that is “physical” in that of course it has no rules of physics or matter, but it is in fact a spiritual realm. It has been described in Gurbani as a palace like that of a King or Guru Sahib’s Darbaar. Sach Khand is a spiritual place of bhagti (devotional worship) and true knowledge. Sach Khand is a place of total bliss and is eternal. The Saadh Sangat (company of the Holy) resides there forever and they are carefree. This Saadh Sangat is continuous there. There is no death or fear. 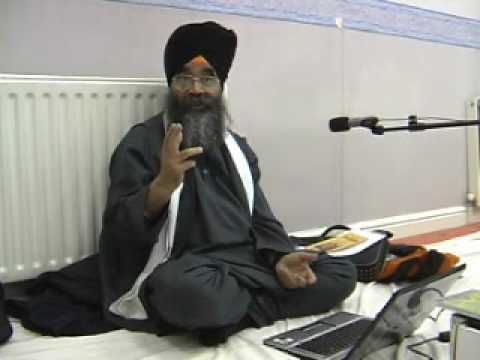 There is only bhagti and bliss and they live on the sustenance of kirtan. They sit in the presence of Waheguru and enjoy the bliss forever. This shabad describes the spiritual state of someone who has reached Dasam Duaar (the tenth spiritual gate of the body) and in that state they can experience Sach Khand and see Waheguru in conversation with his Bhagats (devotees). This great palace is a place of happiness where the Bhagats reside. Inside Guru Sahib describes how sweet this sight is. The Sants there always do kirtan (sing the praises of the Lord) and enjoy the bliss. There is no birth or death or sadness or anything else and amrit naam rains down. Only through Satguru Ji has this place of spiritual being been discovered. The analogy of the sun is given by Gurbani to explain the nature of Waheguru. In that stage of Dasam Duaar, this can be seen and the sights of Sach Khand can also be seen while living in this body. In the last stanza Bhagat Ji says that the Bhagats (devotees) can come and go as they please and there is total freedom there. This explains the army of Shaheed Singhs that many Gursikhs have experienced. These Gursikhs are special souls that have been given this seva (service or duty) and they come on this earth as well. « If there is such a thing as reincarnation, then why is the world population still growing?